The crew of the GCS Dunsparce traveled to the Outer Rim world Banton chasing a lead on the Red Suns. They tracked them down to a warehouse in the capital city where they faced off with Arlon’s former friend Kiril Zhukov. After defeating him, the crew took him prisoner and took a laptop from the warehouse containing information about Gigan Station. The crew interrogated Kiril and learned that the Red Suns used the data to create a virus capable of hacking a warp gate. Kiril also told them the Red Suns were already on their way to Sector 25 to test out the virus. The crew of the Dunsparce now prepare to chance after them. “This is bad,” Morgan says to her crewmates. Arlon, Dmitri, and Shane stand gathered around her, watching her analyze the data on Kiril’s laptop while H sees to the injured Romanov’s wounds. “They used the data they stole from Gigan Station to make a virus capable of hacking a warp gate,” she continues. “Go ahead.” Morgan steps aside and lets Dmitri sit down at the laptop. “We have to stop them,” Morgan says urgently. “No kidding, luv,” Arlon tells her. “But first we need to figure out what to do with our friend over there,” he continues, nodding toward Kiril, still lying unconscious on on the medical table. “Let’s just dump him on some random uninhabited planet to fend for himself,” Dmitri suggests. “Why not just dump him here?” Arlon asks. “He might come after us,” Shane points out. “I would rather dump him on a planet like Dmitri said,” Morgan chimes in. “Fine,” Arlon agrees. “But we’ll at least leave him these.” Arlon places Kiril’s Pokeballs on the table. “I don’t think that’s such a good idea,” Morgan tells him. “We can Wonder Trade them,” Dmitri suggests. “Am I seriously alone on this one?” Arlon asks. “Fine. Do whatever you want. I want no part of this.” Arlon throws his hands up in disbelief, then walks out of the room. Before leaving Banton, the crew travels to the Wonder Trade center in the capital. Arlon looks on scornfully while his crewmates trade away Kiril’s Pokemon, each trading one. Dmitri receives a Floette, Morgan receives a Pidgeot, Shane receives a Trapinch, and H receives a Swablu. They then make a few quick deals with each other; Shane trades the Trapinch to Dmitri for his Houndour and H sells Shane his Lotad. The crew then makes one last stop to pick up some supplies. Morgan also purchases a dawn stone, which she then uses to evolve her Eevee into an Espeon. Arlon purchases a dusk stone for himself, believing he might catch a Pokemon that requires it to evolve. The crew then returns to the Dunsparce and Arlon sets a course for Sector 25, with a brief detour to dump Kiril on a random planet. The crew selects a barren wasteland of a planet with not much more than a few scattered mining stations. Arlon begrudgingly brings the ship down and remains in the cockpit while his crewmates dump Kiril on the ground nearby. With the deed done, Arlon takes off once more, getting back on course for Sector 25. The Dunsparce drops out of warp space in Sector 25 into the middle of heated crossfire between three Federation cruisers and a small fleet of pirate ships lead by the UAS Corsair. A small Sinai meditation sphere flies around the battle, observing. Arlon swings the ship in towards the pirate ship holding near the gate and Dmitri opens fire upon it. Dmitri misses the first couple of shots as the vessel turns in order to return fire. Dmitri hits them dead on with the ion laser and disrupts their shields, he then lights them up with the proton laser and blows the ship up. Arlon pulls the ship up and around the back of one of the Federation cruisers, flying inverted over the top of it so that Dmitri can get an angle on the ship firing on it. He downs its shields with the ion laser, then the cruiser fires a salvo of heavy plasma cannons at it, decimating the undefended vessel. With its assailant destroyed, the cruiser begins to turn in order to assist the other two. On the sensors, Morgan picks up a strange warp signature as the gate begins to glow red instead of its typical bluish-purple. “Something’s happening to the gate!” Morgan announces to her crewmates. One of the Federation cruisers unleashes a massive salvo on the Corsair, but the shots seem to bend around the frigate. The space around the cruiser begins to glow and distort, bending and warping the ship in unnatural directions. “What about you, mate?” Arlon asks the man. “Well, we know exactly what’s going on here, mate,” Arlon informs him. “I’ll try!” Morgan responds. Once in proximity, Morgan hack into the gate and commandeers the Red Suns’ virus. She releases the Federation cruiser from the spatial rend tearing it to pieces and redirects the assault toward the nearest pirate ship. “Nice work!” Arlon yells to her. “Now let’s help that cruiser out!” He pulls a hard turn and flies full speed toward the cruiser taking the brunt of the attack from the pirates. With one cruiser still turning to assist and the other disabled, the Dunsparce is the only ship able to help. Once in range, Dmitri opens fire on the enemy ships. Arlon weaves between the ships as Dmitri lights them up, taking down two of the ships’ shields, allowing the cruiser to take them out with its heavy cannons. With the rest of the pirate fleet destroyed, the Corsair turns away and jumps into warp space. With the danger passed, the Federation ships move to dock with each other in order to evacuate the cruiser critically damaged from the warp gate, and to manage the raging fires from focused laser fire aboard the other. As Arlon looks on through the front viewport, one of the cruisers hails the Dunsparce. He accepts the call and a Federation officer appears on the viewscreen. “Thanks for the assist,” the man says. “No problem, mate,” Arlon replies. “What happened here?” Morgan asks. Morgan shoots him an annoyed glance, then turns back to the officer. “What did they want?” she asks. “Thanks for the heads up,” Arlon tells him before hanging up. He then turns to his crewmates. “If we’re going to do anything we’re going to have to do it now,” he tells them. “I can try,” Morgan tells him. “If we work together, I think we can manage it,” Shane chimes in. “Right then, get on-” Arlon is cut off by the sound of yet another ship hailing the Dunsparce. “Oh, bloody hell! What is it now?” He turns back to the console to see that the Sinai meditation sphere is once again hailing them. Arlon sighs and answers the call. “We’ve been tracking these pirates,” Arlon explains. “Now you really interest me,” the Sinai man says. “My name is Morgan,” Morgan introduces herself. “I’m Dmitri,” Dmitri follows suit. “We’re hoping we can repurpose the virus the pirates used to get us there,” Arlon explains. “Here,” Morgan tells him. She reaches for the console and transmits the coordinates. “What is so special about these coordinates?” Gilgamesh asks. “There was also a promise of knowledge,” Dmitri chimes in. “Humans evolved from Pokemon, I know,” Dmitri says confidently. “But we can still love our Pokemon,” Arlon interjects. “And in the end that is all that matters,” Gilgamesh replies. “Our love for our Pokemon help them to grow. Peace be with you.” The Sinai man hangs up, allowing the crew of the Dunsparce to return to their business. Before anyone can do anything, a loud explosion echoes through the ship. “Can’t we get a bloody moment of peace on this ship? !” Arlon shouts out, exasperated. “Damn it. I thought that would work,” H grumbles. “I’ll deal with it.” He drops off the wall and hurries out of the cockpit. The others follow him to the cargo hold to see what the problem is. Upon entering, they see a giant white sticky mess coating the walls. “Someone had a good time,” Dmitri says with a laugh. Morgan laughs nervously at Dmitri’s joke for a brief moment. “What exactly were you doing in here?” she asks. “Right then, let’s get this mess cleared up,” Arlon says. “Then let’s work on getting to that uncharted sector. After dealing with the mess in the cargo hold, the crew gathers back in the cockpit. As he settles back into the pilot’s seat, Arlon notices a message from Gilgamesh. He opens it to see a brief line of text accompanied by a data package. If you are looking to travel to a sector with no gate, it is important to have a way back. This may help you. “So we’re going to rely on some crazy religious mumbo-jumbo to get us back?” Morgan asks. “Well, if we’re really doing this, now’s the time,” Arlon says. The FNS Scimitar sits in space, docked with the crippled FNS Cutlass. The crew of the Scimitar continues to scramble to evacuate the Cutlass and assess the damage caused by the malfunctioning warp gate. The FNS Rapier floats nearby. Having dealt with the fires and loss of atmosphere, the crew brings the cruiser in to dock with the Cutlass in order to assist with the evacuation. Lieutenant Evan Matthews sits back in his seat on the bridge of the Scimitar, observing his fellow officers go about their business at what seems like double speed. Tasked with monitoring the warp gate’s readings, today his job is all the more important due to the dangerous malfunction caused by the pirate attack. Suddenly, a light begins to flash on Lieutenant Matthews’s console, drawing his attention back to his duties. The warp gate appears to be once again giving off some very strange readings, just like the moments before it folded the Cutlass over like it was made of cloth. However, this time it appears to be behaving differently. “Commander, the gate is giving off some really strange readings again!” the lieutenant shouts to his commanding officer. “Is it going to tear a hole in another one of our ships! ?” the commander responds. The crew watches as the Dunsparce flies into the glowing mass at the center of the warp gate shining off a vivid shade of green instead of the typical purplish-blue hue. The ship collides with the mass and a brilliant blast of light radiates out from the gate. When the light clears, the Dunsparce is gone. “Damn it! What happened! ?” the commander shouts. Session/Revision Notes: This was another chapter that became too long for just one remastered chapter, so this chapter only covers the first half of the session. There was a lot of missing dialogue in the original chapters that I put in to show the crew working out what the virus does and coming up with plans to deal with it instead of it just being a brief description of what happened. I think it turned out very nice, even though it increased the length. This session gave us our first taste of space combat and finally got to put my pilot skills to the test! It was a fun change of pace and pretty interesting encounter. And then we met Gilgamesh for the first time. The dialogue between Gilgamesh and the crew was pretty well documented in the original chapter, so all I had to do was add some polish to make it flow a bit better. In the original chapter, there was a brief line where an officer and the commander of one of the Federation cruiser had a brief conversation when we hacked the warp gate to get to the mystery coordinates. I expanded it a little bit here to be a bit of an end-of-chapter scene not focused on the players, which has happened a few times in Volume 2 and at the end of Volume 1. I think it was a neat way to wrap up this chapter and set the stage for the next one. 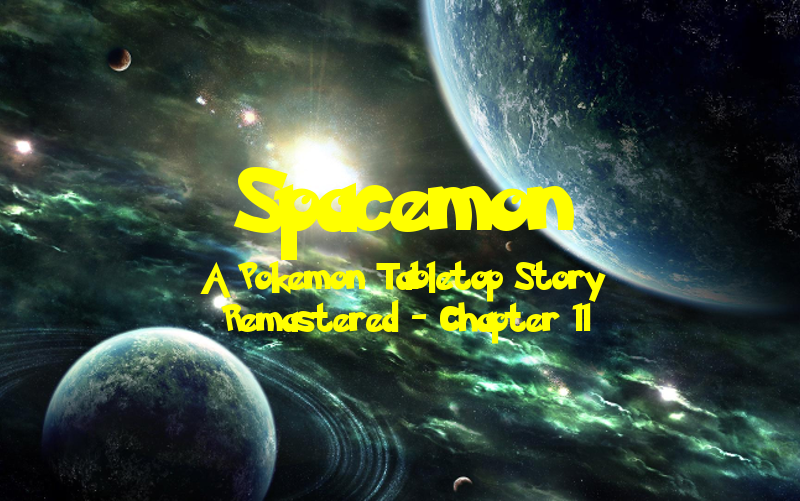 Spacemon: Remastered - Chapter 10: Big Booming Balls on Banton!